Is Your Older Dachshund Peeing In Your House? Our beautiful frosty faced Dachshund Luke occasionally needs reminding to stop sniffing for a moment and pee! We are very grateful that he has not started peeing in our house, however I have been getting a few emails from Dachshund owners who are not so lucky. Some have recently adopted a senior Dachshund only to find out the possible reason for them being in a shelter in the first place – they were not fully housebroken. Others have dachshunds that have just started to pee in the house after years of being fully potty trained! Both are frustrating to deal with but I really want Dachshund owners who are having these problems with their little bundles of joy to actively learn how to stop this behaviour and break the circle of dachshunds ending up in shelters. Read my newest article Older Dachshunds Can Be Potty Trained. Well, after my last post about Dachshund Luke needing his spleen removed I realise how lucky we are. You see we had the money to pay for his operation and Dachshund Luke has owners that love him. This week I found out from one of my friends about little Dachshund Cocoa. Her owner recently died and she is looking after little Cocoa because the owners family wanted to put her to sleep. Her vet has found a lump and they are not sure yet if it is cancer. Dachshund Cocoa’s foster mum has just started a blog that will follow her care and operation. She is hoping that Cocoa will then be adopted and the new owners can carry on the blog. Cocoa’s operation will cost a lot of money so she has put a donation button on the page for anyone who has a spare dollar or two. All of the money will go to help Cocoa get better and well enough to go to a forever home. Michelle (the foster mum) plans to add videos of Cocoa at the vet and document her treatments and recovery. Dachshund Luke had his Spleen removed a couple of weeks ago. We had found a long lump on the side of his body – we were still in Spain at the time and the local vet informed us it was fatty tissue. When we returned to USA we took Luke to his vet to get his local rabies certificate and of course mentioned the “fatty tissue”. This led to strange looks from the vet, mentions of an unlikely place to have fatty tissue and then and x-ray. We soon realised that this was not going to be a quick visit to get his certificates up to date but did not comprehend how sick Luke was. After looking at the x-ray the vet showed us the lump – it took up most of his little body cavity! We were told that his spleen was very enlarged and that there were two lumps attached, one the size of a baseball! I can not explain how shocked we were by this news and how scared we were when the vet said that he wanted to operate of Luke ASAP and that we were to prepare ourselves for the worst. He said that there is a good chance that this is cancer and may have already spread into the rest of his body, he might have to call us during surgery so that we could decide if we want him to continue or put him to sleep. He sent us home to decide if we wanted to go ahead with the operation in the morning or wait a few days to spend time with him. I cried and cried thinking about losing him and of course blamed ourselves for not bringing him back from Spain sooner. My husband and I talked all while Dachshund Luke played with a ball. We decided to take him in for the operation in the morning. After spending a few hours searching the internet for more information we had to stop – most sites gave a low survival chance. Well, I have to tell all our Dachshund friends that he survived the operation (better than us!) and the biopsy showed that he did not have cancer. We are so happy to be able to spend more time with little Dachshund Luke and to see him so healthy. I have been repeatedly asked to publish a book on how to potty train a Dachshund and never seemed to have time. Well, at last I managed to gather all the information into an ebook. I am so excited and wanted to let you all know why. So why am I so excited about my How To Potty Train A Dachshund ebook? 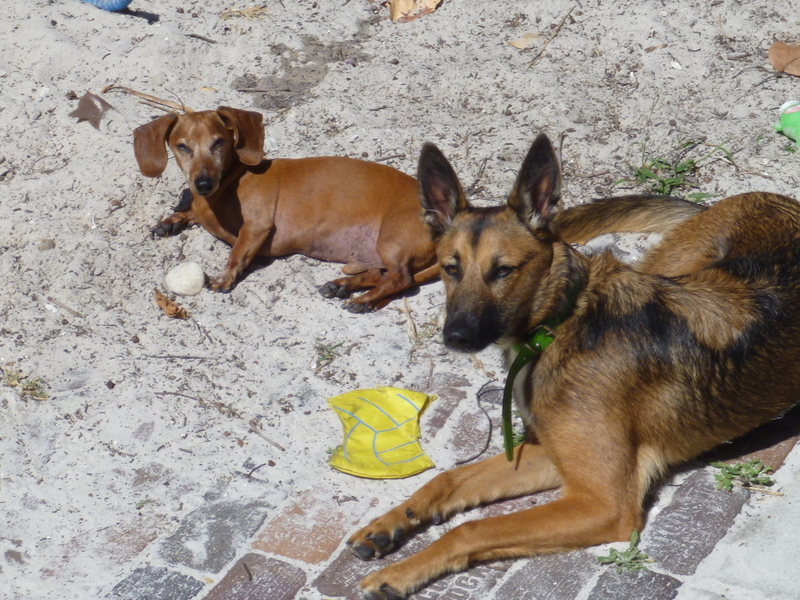 We will be returning to Florida soon and as soon as we are settled will be back to fostering Dachshunds. The rescue groups are in desperate need for foster homes so that they can keep the little ones out of shelters. I will continue to give this ebook to the people who adopt from us but it will now be easier for them to read. In the past it had been a mix of my verbal excitement and hand written instructions! Yep, it would be great if I could just give it away to all Dachshund owners and indeed to have lots of free information on my site, but….. The money earned helps me keep the website going, therefore providing free information on Dachshunds. I can also put the money towards the foster Dachshunds so I will not need to get money from the Dachshund Rescue groups. Well, my Dachshund friends if you have a Dachshund that you are having trouble potty training please take a look at my ebook. It is written just for Dachshunds – Yes they can! Ok, here is the link so that you can see what I am rambling on about. Will warn you that there is no professional in your face sales page – I am not good at that. I am just a Dachshund Lover that likes to spread the word about how wonderful this breed is. Hi all it is Dachshund Luke here. Here is a funny video of me and the foster puppy. The puppy is a German Shephard and always wants to play with my toys. Everyone who knows me is very aware that I love my Dachshund toys and really do not see why I should be sharing them. Only problem I have is that my legs are so short. The puppy already has longer legs than me and apparently is stronger too! I have had a lot of questions from Dachshund owners about how much exercise they need. Many people think that due to their tiny legs that they can get all the exercise they need by running around the house. Lets face it we love our Dachshund’s and they loved to be picked-up and sit on laps. Some little legs rarely hit the floor! I also feel that there is more to it than chasing a ball. They need to go outside to prevent boredom, being overweight, socializing, over coming fears and for training. Do you walk your Dachshunds? So, how much exercise do your Dachshund’s get? – Dachshund Luke would love to know, just incase he is missing out on something! Just letting you know that there is free shipping (ground) until March 22nd being offered on my book Dachshund Luke Goes To Spain. We donate money to Dachshund Rescue for each book sold. Would make a great gift for a Dachshund lover!